The end of this long 2018 midterm election cycle is upon us, and we are about to hear the political verdict of millions of Americans. With approximately one-third of the country -- at least 34 million people -- having voted early, tomorrow is not Election Day per se, it is the conclusion of many election days around America. And it looks like this will be an historic election in terms of engagement and turnout. In no midterm election cycle have more than 90 million people voted, and we are very likely to blow right past that and exceed 100 million voters nationwide. Add 2020 Elections as an interest to stay up to date on the latest 2020 Elections news, video, and analysis from ABC News. 1. Pay close attention to the early voting election returns. In some states like Florida, Texas and Nevada, early voting could make up two-thirds of all votes cast, and it will give us early signs of where those states are headed. One cautionary note: we don’t exactly know how many of those early votes were cannibalized from people who normally vote on Election Day. However, some initial analysis shows that many of these voters have never voted in a midterm before. 2. We are going to see another epic political battle between two pillars of American politics: geography vs. demography. In 2016, President Trump carried the Electoral College (geography), and Hillary Clinton carried the popular vote (demography). It seems highly likely that Democrats will carry the popular vote tomorrow, and the GOP will win more counties. The question is if the Democrats have their votes efficiently spread across districts and states to overcome the GOP’s geographic strength. We should know the answer to this fairly early on in the evening as states like Indiana, Kentucky, and Virginia begin to report results in key races. 3. This is the first election in modern memory where the bases of both parties seem very energized and engaged. Normally one side is lukewarm and the other is hot. Today, both are on fire. This is one big reason why there will be a record voter turnout. One cautionary note for the GOP: the Democratic base this year looks much larger than the GOP base, and this is reflected in the strongly approve vs. strongly disapprove attitudes towards the president of likely voters. Among those most engaged likely voters, 35 percent strongly approve of the president while 48 percent strongly disapprove. And while intensity is matched by likelihood to vote, the size of the bases are much different. The GOP base is composed primarily of white voters over age 45, the Democratic base is very diverse: people of color, younger voters, suburban/urban women, etc. 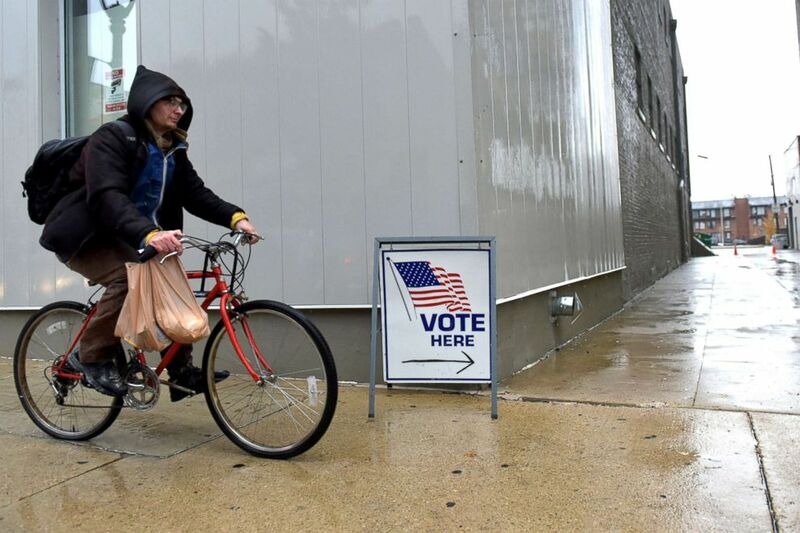 A cyclist passes by a sign directing voters to a polling station in Milwaukee, Nov. 4, 2018. 4. Independent voters spread across America will decide this election. Those voters who either don’t register a party affiliation or decline to state will determine the winners and losers on election night. This is also what happened in 2016 and previous midterms. And so while people are basing their expectation of early voting on the party affiliation of registered voters, we don’t know about those who have no party registration. In many key states, Democrats seem to have about a 7 point lead among these independent voters. 5. The economy is doing well according traditional indicators as well as voter confidence, but it is not helping the incumbent president or party. In every other election, when the economy was doing anything close to this well, the incumbent party either picked up seats or didn’t risk losing the House or Senate. The president has so personalized his time in office, constantly gets in his own way on other extraneous issues, and has only been communicating to his base and not America as a whole, he is getting no advantage from the economy in this election cycle. These are just five of the thoughts to keep in mind as we journey the last few miles of an exciting, unique and historic midterm marathon election.